With the adoption of NGSS, I’ve had to make cuts to some of the lessons that biology classes of the past enjoyed. I was sad to see it go, but we no longer do a unit on the Kingdom Protista. 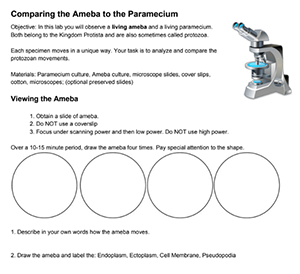 These lessons included coloring worksheets and a microscope investigation where they viewed live paramecium, ameba, and euglena. While the unit is no longer covered, I can sometimes fit a mini lesson on protists as part of a taxonomy unit that covers the six kingdoms. Live specimen can be ordered from Carolina and students can use them to practice their microscopy skills. They are always excited to find their first moving protozoa, it’s almost as if they thought I was lying to them about tiny little organisms living in pond water. In fact, if you can’t include protists with the taxonomy unit, you could sneak it in with the cell theory where you discuss Hooke, Schleiden, Schwann, Virchow and van Leeuwenhoek who famously coined the term “animalcules” to describe the tiny organisms that were living in pond water.